The wonderful cat that owns us is named Kidders. Kidders was a cat that was going to the pound if a home wasn't found for her. She was 3 months old when she came to live with us. When she was of age I took her to be fixed and declawed. I didn't know at the time what they do to "declaw" a cat. I would have never done it if I did. I had asked the vet if I should be giving her any thing for the pain. I was informed that cats don't feel that much pain with this surgery. 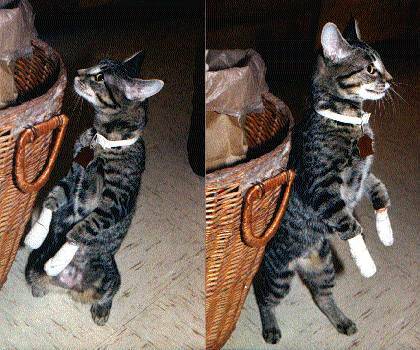 After bringing her home, Kidders would not put her front feet down. I called the office back several times and was finally told that I could give her baby aspirin and the amount for her weight. I told them if cats can't feel that much pain then why is she walking on her hind legs. 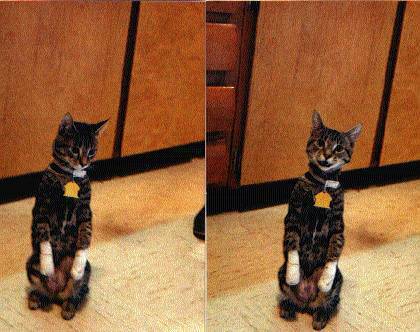 She walked on her hind legs for over 3 weeks. I will never have another cat declawed. I will use the money from having the cat declawed to buy post and other things for the cat to scratch on. I believe vets should have to tell people what is going to happen to their cat not just say "declaw." Kidders doesn't get along with other cats. She bites my daughter. I believe that she wouldn't feel so intimidated if she still had her claws. Please think again and get all the information before you declaw your beautiful loving cat.